US shoppers are more likely to use a computer – desktop or laptop – to post online reviews after buying a product. 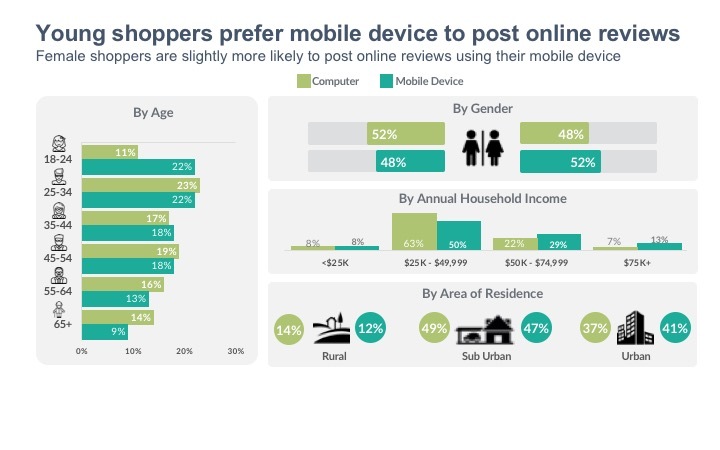 More than three in five (61%) shoppers use a computer to post online reviews compared to just over two in five (41%) shoppers who use a mobile device – smartphone or tablet. However, the trend is shifting in favour of mobile, driven by younger shoppers – especially young millennials aged 18 to 24 who overwhelmingly prefer mobile device over computers to post online reviews. Twice as many younger millennials post online product reviews using their mobile devices (22%) compared to computers (11%). 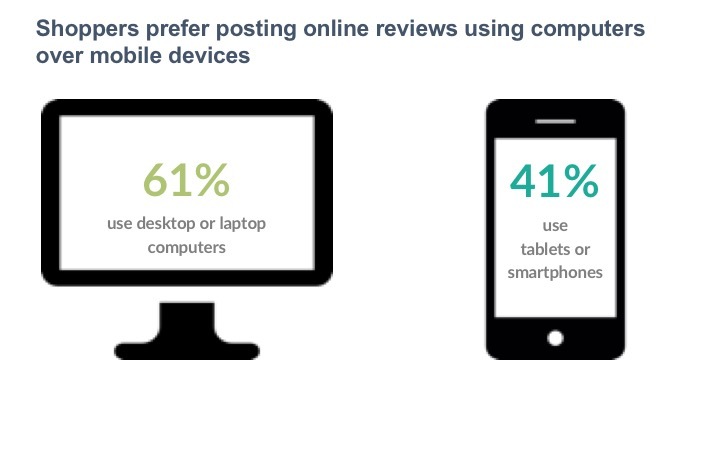 Generation-Xers are already using mobile as much as their computers to post online reviews. Female shoppers (52%) are slightly more likely to use mobile device to post online reviews compared to male shoppers (48%), making mobile a key device to focus on for apparel, beauty, and home, garden & pets brands who want to both monitor existing reviews as well as generate future reviews. 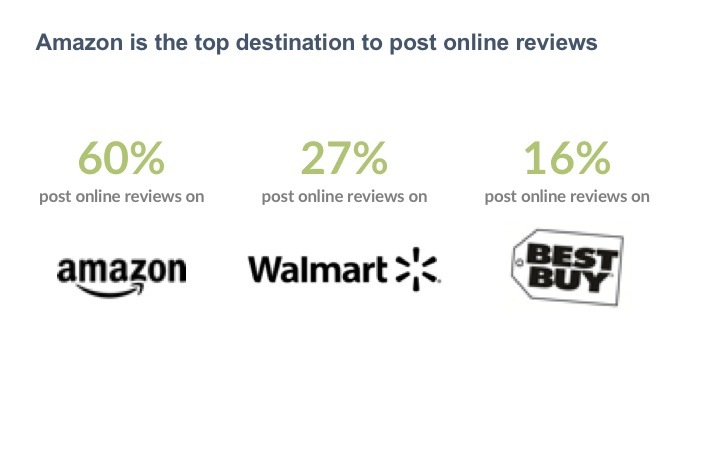 Most reviewers turn to e-commerce giant Amazon when it comes to posting online reviews. Three in five shoppers visit Amazon to post reviews compared to less than three in ten (27%) shoppers post reviews on Walmart and less than one in five (16%) shoppers who post reviews on Best Buy. Amazon’s prominence is not surprising because nearly two in five (38%) shoppers prefer to post reviews on the retail website where they bought the products from. As Amazon tends to be the site shoppers buy online, it is only natural for them to go back to the site of purchase to post a review. Some shoppers even prefer posting a review on Amazon despite having bought the product from another site or from a store. More than one in five (22%) shoppers prefer posting a review on Amazon for purchases made elsewhere. While monitoring Amazon for reviews should continue to be a key focus for brands, they have an additional opportunity in generating reviews on their own website. Nearly three in ten (29%) online shoppers say they would like to post a product review on the brand’s website compared to online forums (16%) and the brand’s own Facebook page (13%). 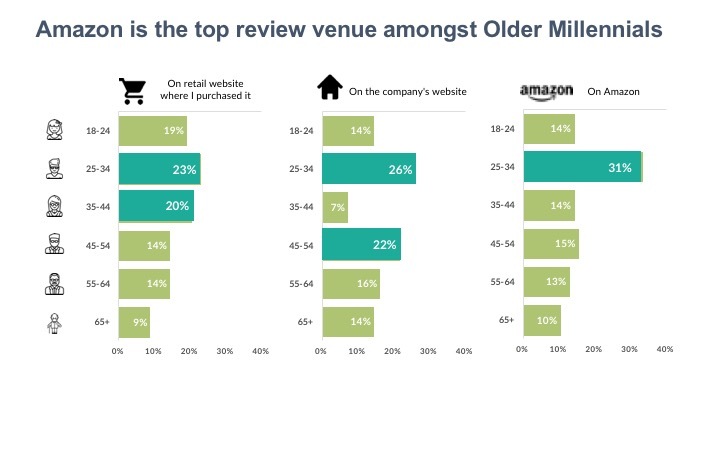 Older millennials aged 25 to 34 (26%) and older Generation-X shoppers aged 45 to 54 (22%) are the most likely to post reviews on a brand owned website. Female shoppers (55%) also prefer posting reviews on brand owned websites compared to men (45%). In a mobile driven consumer culture brands should not expect shoppers to post detailed online reviews around their purchase and product usage experience. 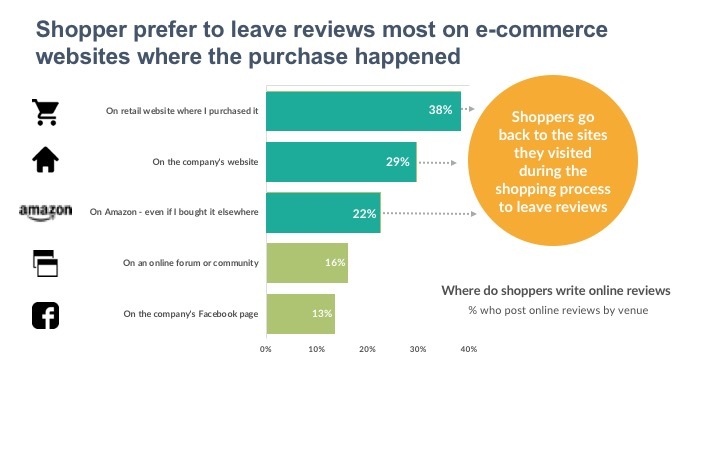 Ratings are increasingly popular with shoppers who want to leave feedback after purchase. 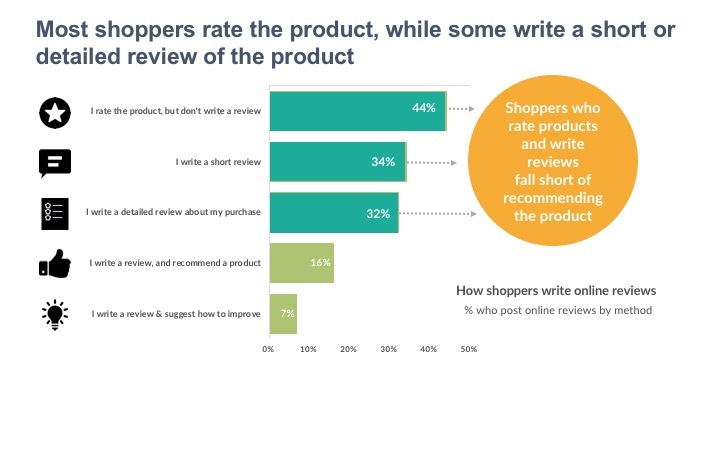 Nearly half (44%) of shoppers rate the product but do not write a review. Ratings are not only quick but give an accurate read into how the shopper feels about his or her purchase. This means brands should be monitoring ratings more frequently as well as integrating their own websites and apps to collect quick ratings. Older millennials are most likely to leave a quick rating. More than a quarter (26%) of 25 to 34 year olds leave behind quick ratings instead of writing a review. 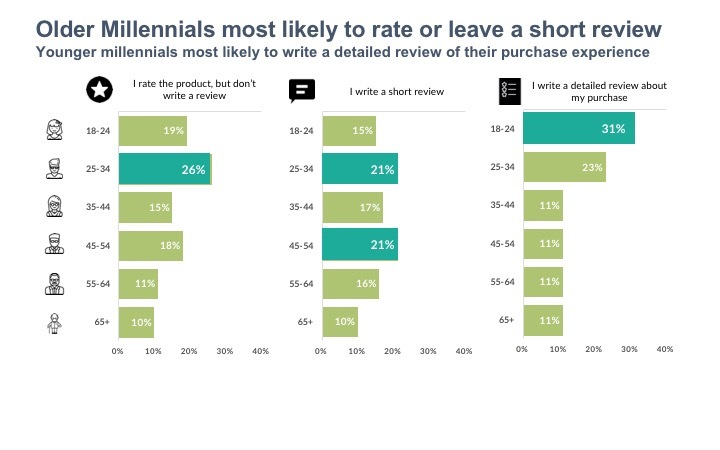 Surprisingly, younger millennials aged 18 to 24 are the most likely to leave behind detailed product reviews with more than three in ten (31%) saying they do so. This could largely be because they have the free time to do so as well as most purchases they make cut into their smaller wallet making it seem important to leave behind a detailed review. Leaving behind a quick rating is equally popular among male and female shoppers. 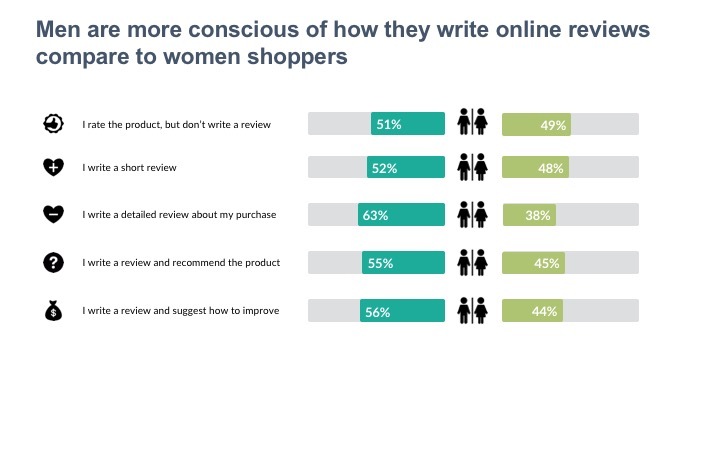 However, when it comes to writing detailed reviews, male shoppers (63%) are much more likely to do so compared to female shoppers (38%).